The city of Legnica is located in Lower Silesia, in the southwestern part of Poland. The miracle happened during the Christmas Mass of 2013, when a consecrated Host fell to the ground during the distribution of Holy Communion in Saint Hyacinth’s Church. The Host that should have dissolved in the water began to transude Blood and to form human-looking Flesh. 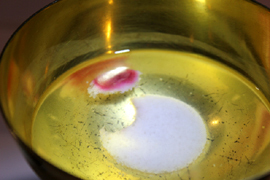 The Host was collected and placed in a container with water (vasculum) to dissolve, as mandated by wise canonical norms in such cases, and which today are lamentably so often ignored. 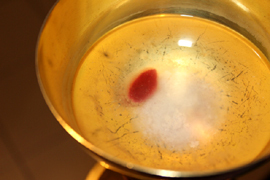 But once in the water, a red stain with a unique texture resembling human tissue appeared in the Host. The Most Rev. Stefan Cichy, then Bishop of Legnica, established a commission to investigate the miracle with the Sacred Host. 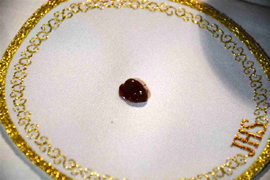 In February 2014, with the permission of the diocese, a Host fragment looking like bloody tissue was removed and placed on a corporal. 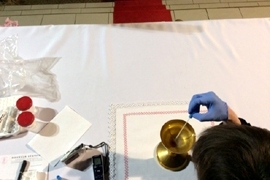 Samples were then collected to be analyzed in laboratories of different forensic institutes. 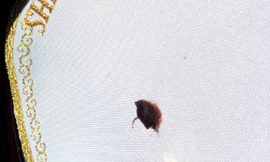 A Host fragment looking like bloody tissue was removed and placed on a corporal. 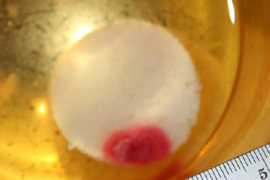 Samples of this tissue were sent to be analyzed in laboratories of different forensic institutes. Given the importance of the forensic medical opinions, in January of this year Bishop Kiernikowski submitted the case to the Congregation for the Doctrine of the Faith in the Vatican for theological consideration. This leading Congregation of the Holy See expressed its support to having the miraculous Host exposed for public adoration and recommended the faithful be given a detailed explanation. The Host is exposed in a chapel of the sanctuary under the responsibility of the pastor, Fr. Andrzej Ziombrze. The bishop’s hope is of great importance for our days, when some seek to give the Holy Eucharist to public sinners, ignoring that the Body, Blood, Soul and Divinity of Our Lord Jesus Christ are truly, really and substantially present in the Blessed Sacrament. 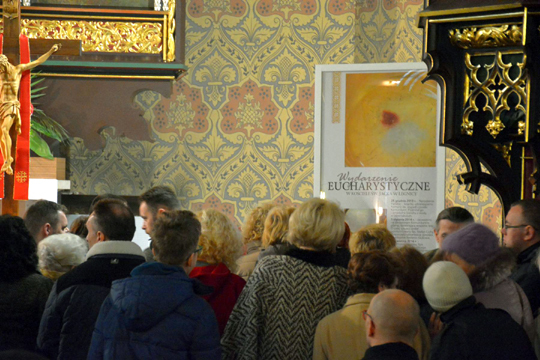 Pilgrims flock to see Eucharistic miracle at the Curch of Saint Hyacinth in Legnica, Poland. 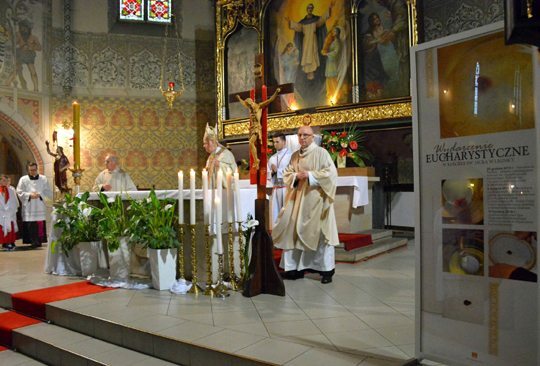 Very significantly, the miracle happened in the church dedicated to Saint Hyacinth (1185-1257), called the “Apostle of the North.” The Saint was a Polish Dominican of the thirteenth century, great preacher of the Eucharist and Adoration of the Blessed Sacrament. In 1240, pagan Mongol hordes invaded the Slav world, then in a process of conversion, devastating cities and fields, and pillaging churches. They attacked the city of Kiev, now the capital of Ukraine, where Saint Hyacinth prayed daily before the Blessed Sacrament. 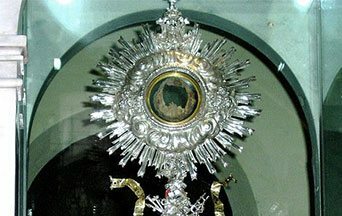 Knowing that the city would fall into the hands of the barbarians, he took the ciborium containing the Sacred Hosts to flee the city and save the Holy Eucharist from desecration. Just as he approached the door of the church he heard a loud voice cry out: “Hyacinth, Hyacinth!” To his great astonishment, the Saint perceived that the voice came from the heavy alabaster statue of Our Lady, which was on an altar near the center of the church. And indeed, the statue became as light as a feather. Saint Hyacinth then placed both the ciborium with the Blessed Sacrament and the statue of the Virgin under his Dominican cape. Accompanied by his friars, he miraculously crossed the great river Dnieper, which runs through the city, and passed undetected through the camp of the Mongol barbarians. Exhausted from his rigorous apostolate and vast journeys founding Dominican monasteries and preaching from Scandinavia to the Black Sea, he spent his final days in his native Poland, where he died in the city of Krakow. 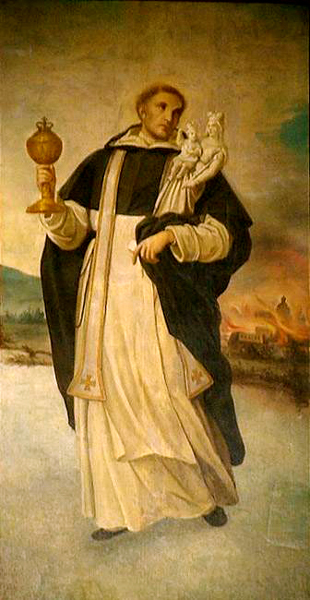 Saint Hyacinth the Dominican Preacher carries the Holy Eucharist and statue of the Blessed Virgin to safety. But, long after the end of the Middle Ages, his influence lived on. Three centuries later, when the Protestants denied the Real Presence of Jesus Christ in the Eucharist and furiously revolted against devotion to Our Lady, the name and images (paintings, pious icons, and sculptures) of Hyacinth multiplied at an amazing pace, even though his canonization process was still under way in Rome. It was then that the Popes approved the dissemination of devotion to him. He was canonized on April 17, 1594 by Pope Clement VIII. Pope Innocent XI named him Patron Saint of Lithuania. Saint Hyacinth’s devotees highlight that the above-described Eucharistic miracle was approved by the diocesan bishop on April 17, 2016, the anniversary of the Saint’s canonization. He is depicted holding a large statue of the Virgin in one hand and a beautiful ciborium with the Holy Eucharist in the other, miraculously crossing the river and the barbarians’ camp. Saint Hyacinth is widely venerated for his miracles and the heroic example of risking his life to prevent the Holy Eucharist from becoming the object of profanation or sacrilege.